ii. Who is Richard Parker? The following paper deals with cannibals. A topic which is very unlikely to concern the normal European citizen of today, yet the thought of people consuming other people is fascinating, for it seems to follow mankind throughout its history, in culture and also to a great deal in literature. Surprisingly, it never seems to occur in front of our eyes, and only very seldom a reliable witness for such practises can be found. It is something that happens on the borders and in the shadows of societies. Nobody can imagine that anyone could openly confess or practise cannibalism, without being persecuted to the fullest extent of the given law. Cannibalism is considered a horrible crime that touches us deeply and which cannot be forgiven. Committing it is not only a huge crime against our moral standards, it often goes hand in hand with other crimes like murder and various pervert behaviour. Whoever commits this crime may not even be considered human anymore and may be treated like an animal, for it seems to be the ultimate borderline between men and beasts. It therefore can also be used as an instrument of defaming others, because unfortunately the basic principle of in dubio pro reo does not work here. Once accused, it is very hard to get rid of the fame of a crime that is generally considered to take place unseen. In literature the topic is widely spread and there it mostly separates the good from the bad. It is sometimes regarded with abhorrence, sometimes with interest, but never with neglect and without emotion. 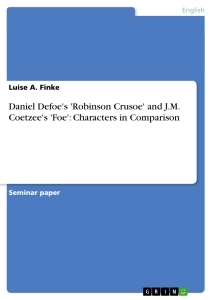 This paper investigates the usage of the motif in two very different novels, Daniel Defoe’s Robinson Crusoe, published in 1719, and Yann Martel’s 2002 novel Life of Pi. Since cannibals appear in both books, the following aims to identify the ways, in which both authors use the motive and then take a closer look on what they have in common and where they differ. In order to tackle this problem, a short historical outline and few major facts about the topic will be explored. After that the use and the nature of the motive in the two novels will be looked at before the paper goes on to investigate whether they are any similarities, and what the major differences are. Concluding (…). The main references that helped to get an overview of the topic were “Das Andere Essen”, a series of investigating paper published by Daniel Fulda and Walter Pape, Peter Hulme’s “Colonial encounters” and William Arens’ “The Man-Eating Myth”. The most important treaty of Robinson Crusoe was Maximillian E. Novak’s contribution in the named work of Pape and Fulda. To get an overview about Yann Martel’s Life of Pi the articles by Pankaj Mishra and Elsie Cloete in the Literature Resource Centre also proved helpful. But before turning to the treated novels, the some general information about the anthropophagic motive must be given. 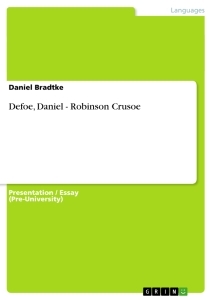 First of all, in order to look at the motive of anthropophagy in Robinson Crusoe and Life of Pi, it is necessary to define what it actually is, and what its variations are. Giving a few basic historical facts and having a look at the terms of the wandering myth will also be of use as soon as this paper moves on into more detail of the novels to be treated. By definition, cannibalism is the act of consuming co specifics throughout the animal kingdom, but also among humans. If it is strictly about human being the more correct term would be anthropophagy, which does not include animals, but in this paper cannibalism will be used for the description of both, humans and animals. There are various forms of anthropophagy according to what the motivation is, and how they are carried out. The most important ones are mentioned in the following. Mythical cannibalism means it is the crime occurring in myths about the origins of the world, for example the ancient Greek myth of Cronus, a titan who ate his children to prevent them from overthrowing him. In religious cannibalism the act is carried out as a sacrifice to god(s). In ritual cannibalism, the consumer eats the body of another person as a means to bury him. Some native tribes in Papua New Guinea, who are known to consume a drink made out of milk and the burned ash of a relative, may serve as an example here. A more psychologically motivation for anthropophagy is doing it out of fear, and thus storing an enemy in the safest place one can imagine, oneself. The Aztecs in medieval Central America are till the present day famous, or rather infamous, for performing magical cannibalism trying to adopt the personal features of their victims, such as strength, sight or intellect. In the juridical sense, cannibalism is a means of punishment and as a last variation nutritious cannibalism should be mentioned here. In the latter, eating another person serves the culprit as a last escape from starvation and this seems to be the one form of the crime which tends to be excused by others more easily. Although it has often been used to defame other persons or groups of people, the act of humans eating other human has occurred several times throughout history, and the situations in which it has occurred have always been somewhat extreme. In the following a few such incidents will be presented in order to give an overview of the topic’s reality. First of all, there is archaeological evidence that this has happened among our biological ancestors as well as in prehistoric cultures of our own kind. Our closest biological relatives today (the bonobo chimpanzees) have also been watched eating their own kind. 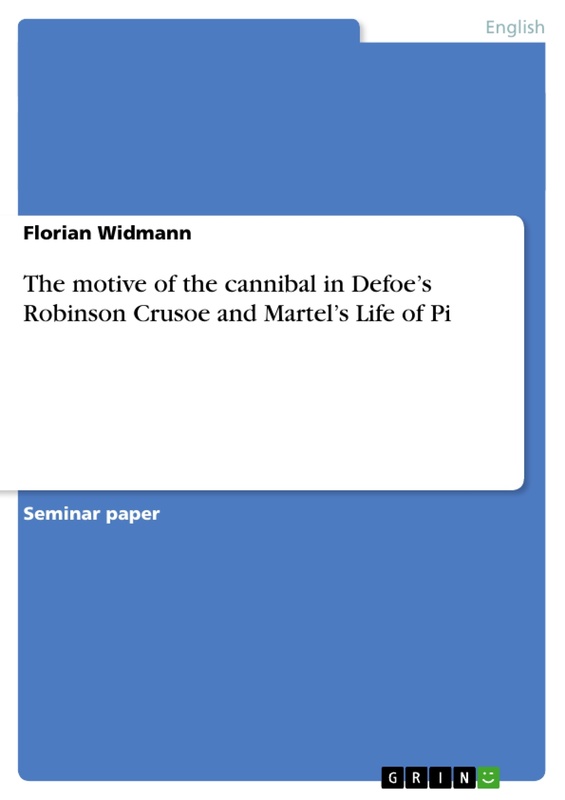 Because of the lack of available information it is however difficult to identify the motivation for doing it though nutritious, magical and religious cannibalism seems to be the most likely form to the author of this work. Another example of nutritious cannibalism has occurred after a terrible plane crash in the Andes in the Seventies of the last century. In this case the survivors, who were seeking shelter in the remains of the crashed plane, were forced to eat part of the dead bodies in order to stay alive until they were finally rescued. This is a case that can hardly be considered a crime, for if it comes to saving one’s life, cannibalism can also be looked at as a kind of self-defence. The same goes for incidents in Russian labour camps after World War II where the prisoners had to choose between starving and consuming their dead prison mates. The most recent case that has stirred the German public’s attention and the media was the Cannibal of Rothenburg, a man that had killed and eaten another man, and although the deed had been planed in a mutual agreement, it was widely considered a pervert crime against humanity. Unlike the examples of nutritious cannibalism above, there was no way for the culprit to find any acceptation or at least understanding. Aside from these rather rare cases, where the crime has actually happened, the accusation of the crime has frequently been used to defame people who were not guilty, yet had to suffer the consequences of being accused. The reasons for accusing someone falsely of such crime are simple. This is a perfect instrument of putting others onto the edge of society and to consequently outlaw them. It matters not, whether such accusations are proven or not, because it is extremely hard to prove yourself innocent, and once the public is convinced, nobody will believe what a person that has committed such a crime says in his defence. Thus the accusation can be used to get rid of personal or political enemies, or to deny them rights they would have had otherwise. This accusation hit, for example early Roman Christians whose ritual of the last supper was deliberately misunderstood and so they were made easy to persecute, and other crimes they were accused of, such as them setting Rome on fire when Nero was imperator did not need much evidence and investigation anymore. The same thing happened during the middle-ages, this time carried out by the Christian church herself, when suspected witches and werewolves were accused of devouring little children in order to outlaw them and have them burned and tortured. In this case, there was even a guideline for the persecution called the malleus maleficarum, the hammer of the witches. And after the reported voyages of travellers like Marco Polo, Christopher Columbus and Amerigo Vespucci a kind of wandering myth was created that had its origin in literature as old as the Homeric Epics and was passed on to generations afterwards. 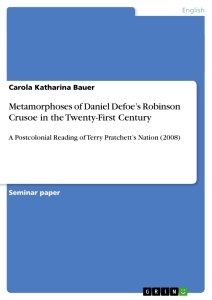 Since this paper’s goal is to investigate the use of the anthropophagic motive in two novels, a short introduction into the spreading of the topic in literature tradition should be given, too. Therefore the following provides a small outline of the most famous literal works that have cannibalism a topic. The motive of anthropophagy in literature is as old as (at least) western literature itself. In the first pieces of western literature, Homer’s Iliad and Odyssey, we can already encounter the Cyclops Polyphem, who lives on a distant island on the edge of the known world. He is described as a “blasphemic beast” which lacks any kind of civilized behaviour and “stuffs his fat belly by devouring the flesh of humans”. He eats some companions of the stranded Ulysses before he is tricked and blinded by the same. Although quite unknown to most people, the Bible also mention cannibalism, for example in one episode in the second book of Kings, during the siege of the city of Samaria two people come the an agreement about feeding their hunger by eating their children. Another, more famous example is the scene of the last supper, when Jesus Christ asks his disciples to eat his body, and to drink his blood. Of course this seems to have a ritual character, and Jesus was not actually eaten in this case. Yet it is until today a Catholic dogma that bread and wine during the consecration change into the very body and blood of the Saviour and therefore a variation of religious man-eating can be identified. In this case, however, the ritual is an act of love and of unity with god. The terrible consequence this misunderstood ritual has had in ancient Rome has already been mentioned. In Shakespeare’s Titus Andronicus the crime is once again brought into context with strangers or outsiders, when the Gothic queen Tamora is tricked to eat her own children. The Malleus maleficarum written by Institoris, a German monk in 1487 uses the accusation to outlaw the so-called witches and werewolves. It claims, for example, that there are evil midwifes who, should they not cause a child to be stillborn, “devour the child or sacrifice it to [a] demon”. Werewolves who kill and eat innocent people have already lost their humanity by transforming into an animal before carrying out their sin. The same thing happens frequently in Grimm’s Märchen, the most prominent being the fairy tale of Hänsel and Gretel, where the witch plan to batten the boy and to eat him afterwards, and the fact that these fairy tales were collected among the German people of the time is yet another indication of how deeply the cannibal had been planted into the minds of people. Further information in: Parrado, Nando, 72 Tage in der Hölle: wie ich den Absturz in den Anden überlebte. München, Goldmann, 2008. Albrecht Lehmann, Hungerkultur. Zur Erfahrung des Nahrungsmangels in der totalen Institution sowjetischer Kriegsgefangenenlager des Zweiten Weltkriegs, in: Uwe Spiekermann (Hg), Ernährung in Grenzsituationen, Berlin 2002. S. 113. Kramer, Heinrich (Institoris): Malleus maleficarum (1487). Menninger, Annerose: Die Macht der Augenzeugen. 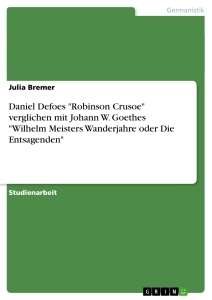 Neue Welt und Kannibalen-Mythos, 1492-1600. Stuttgart 1995. Homer, The Odyssey, 9, 428. The Holy Bible, 2 Kings, 6, 28. Shakespeare, William, Titus Andronicus, Cambridge, 1994. 5, 3, 59 – 62. Institoris, Malleus maleficarum, Sprenger, Jacob (Hg. ), München, 2001. I, 11. Kinder- und Hausmärchen, gesammelt durch die Brüder Grimm, genehmigte Ausgabe für den Engel Verlag, München. S. 65.